Red River Town Hall is located at 100 East Main Street, Red River, NM 87558; phone: 575-754-2277. Photo: View of the Town of Red River, New Mexico. Photographed by user:LosDavishan99 (own work), 2009, [cc-by-3.0 (creativecommons.org/licenses/by/3.0)], via Wikimedia Commons, accessed October, 2015. The Town of Red River, New Mexico has a rich history and its natural context is spectacular. Red River is located within the southern Rocky Mountains, and is part of the Sangre de Cristo Mountain range. It is surrounded by the 1.5 million acre Carson National Forest and is part of New Mexico's Enchanted Circle. Red River sits at 8,750 feet in elevation within a dense forested area of mixed conifers and spruce trees. The Red River area has been home to hunting, mining, and tourism activities over the past couple of centuries. Red River was roamed by Ute and Jicarilla Apaches until the 1880s. It was then discovered by early explorers and fur trappers who first mapped the area and named it 'River City'. The community was eventually renamed Red River after the river that runs through Town, which turns red after a heavy rainfall. In the late 19th century, the Town of Red River experienced an influx of miners who were later disappointed by the lack of ore, high development costs, and the lack of investment money. Some miners; however, were able to overcome the odds and achieve success. Their success stories attracted additional newcomers to the Town of Red River whose minds were on the prospect of acquiring gold, silver, and copper. Homesteading began in the late 1800s by Ed Westoby and Sylvester, Orin, and George Mallette. By 1895, the population in the area increased to about 2,000 people and Red River officially became a town. By 1900, Red River's population had grown to 3,000, and fifteen saloons, four hotels, a sawmill, a barbershop, and a red light district were built. Hundreds of gold, silver, and copper mines were carved into the sides of the Sangre de Cristo Mountains, which continued on to about 1925 in the Goose Creek, Bitter Creek, and Pioneer, Mallette, and upper Red River Canyons. Molybdenum (used in the process of making hardened steel) was discovered in the lower Red River Canyon in 1916, and eventually replaced gold, silver, and copper mining. 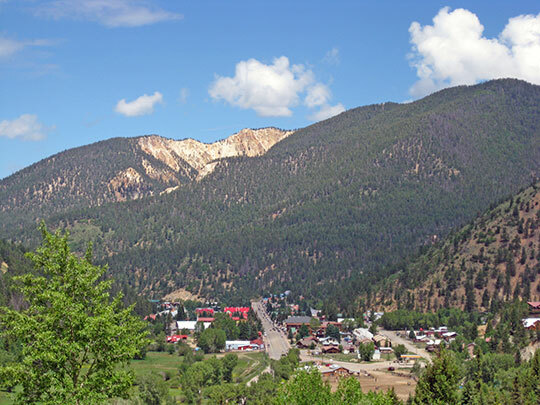 The first "moly" mine was built in an area located between the Town of Red River and the Village of Questa in 1921 and was owned and operated by Molycorp, Inc. Underground mining continued on to 1958, and then exploratory drilling began. By 1965, open pit mining had started and continued until 1981, and then was replaced by block-caving methods. The mining boom and bust was eventually replaced by tourism in the late 1920s, starting with the rental of discarded mining cabins to the opening of the Red River Ski Area in 1959 that currently sits just off Main Street. Today, the Town of Red River welcomes thousands of visitors each year and is home to 477 people. During peak season, the Town provides service to anywhere from 5,000 to 10,000 people who mainly travel in from other locations across the state, Texas, and Oklahoma. The Town boasts a family-oriented vacation destination with activities ranging from mountain-based options such as skiing, hiking, and biking to exploring creeks, the river, and various wilderness trails. Several historic structures that were built in the late 1800s remain in Red River. These include the Little Red Schoolhouse, Sylvester M. Mallette Cabin, Orrin Mallette Cabin, Melson-Oldham Cabin, Pierce-Fuller House, and the Red River Miner's Hospital/Westoby House. Consensus Planning Inc. and Guy Jackson Associates, Inc., for Town of Red River, New Mexico, Town of Red River Comprehensive Plan, 2013, www.redriver.org, accessed August, 2015.